This word is not often associated with water debates in California, but as the rainy season comes to a close and the window for legislative action this year shrinks, it is starting to be used by a surprisingly array of stakeholders: optimism. “More than any other time in the last 30 years, I’m optimistic that there is a level of scarcity in this drought—with the depletion of water resources at basically every level, from water delivered by the state or federal water projects to water contractors north and south of the Delta, to cities, and even riparian water rights holders—that it's prompting a dialogue that hasn’t happened before,” says Jay Ziegler, director of external affairs and policy at the Nature Conservancy, a longstanding Economic Summit environmental partner. The Summit has made investing in water infrastructure a top priority, outlining 11 actions the state can take this year to respond to the drought in sustainable ways. Some insiders believe the urgency around the drought has even created the first glimmerings of a “grand bargain” on water—with lawmakers discussing three distinct policy vehicles that together could take on state water challenges in ways that meet the needs of an array of water stakeholders. These include a set of bills aiming to improve how the state manages its groundwater (the invisible source of water for almost half the state’s population in dry years), a politically complicated attempt to raise between $6 billion to 9 billion through a water bond (funding projects ranging from water storage to watershed restoration), and a still-relatively-quiet effort to give communities more funding flexibility to invest in water infrastructure (perhaps through statutory changes to Proposition 218 that would allow locals to raise fees to pay for stormwater, flood control, and groundwater projects—popular water services that existing law makes it difficult to fund). Time right for a deal? 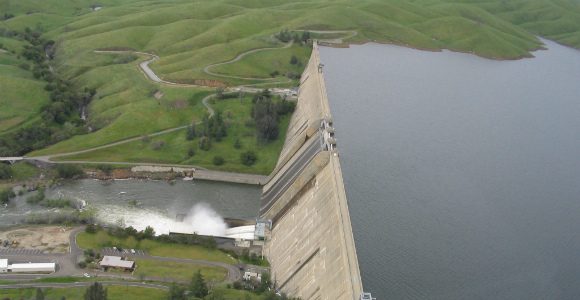 With the state’s snowpack at 32 percent of normal, with many reservoirs already dangerously low, and with some experts pointing out that half of the water in the mountains has already melted away in the past few weeks, the time may be right for deal-making. 1. Groundwater management: With some water-starved communities and farms digging ever-deeper wells to get the water they need—raising concerns about “sinking” land in parts of the San Joaquin Valley—the issue of how to manage the state’s groundwater system has rushed to the top of the agenda this year. “I am encouraged by the convergence I see,” Felicia Marcus, chair of the State Water Resources Control Board said at a groundwater workshop last week where experts reviewed a comprehensive groundwater management plan released recently by the Association of California Water Agencies. “This is the year to do it,” agreed Jonas Minton, a water policy advisor for the Planning and Conservation League, saying stakeholders had reached an “unprecedented consensus” about how to solve the problem. 2. Water bond: Progress on groundwater may also be a good sign for the water bond, where lawmakers remain divided over how much money a November ballot measure should have in it—and what kinds of projects it should support. The politics surrounding the bond have become dizzyingly complex, with Republicans in the Senate (who now hold the key to the two-thirds vote) holding out for $3 billion for storage—with the support of ACWA and some Central Valley Democrats. Senate and Assembly Democrats continue to disagree over how to distribute funds to the Delta and more than a $1 billion in watershed restoration projects. The governor, meanwhile, has stayed mum on which approach he prefers—or even whether he will support a bond going on the ballot in the first place. Insiders say a broader deal that connects groundwater management and a bond could be the best opportunity for both to pass. Agricultural groups desperate for surface storage funded by the bond, for example, may be more amenable to supporting changes to groundwater management that integrate surface and groundwater resources. Environmental groups, for their part, may support a legislative changes that require locals to create detailed groundwater management plans before receiving public funds—especially if this is part of a deal to create a more robust groundwater monitoring system. 3. Funding flexibility: While these groups continue to circle around a water bond, sources say the governor has quietly expressed interest in finding what staffers call a “more sustainable” way of paying for all of these investments in water infrastructure. This approach is certainly consistent with the governor’s support for “subsidiarity”—as well as his continuing calls for fiscal discipline in the state budget. Multi-billion dollar bonds may be necessary to invest in water infrastructure where there is a state interest, but the governor has clearly expressed his concerns with borrowing money. A $10 billion bond, for example, requires the state to spend almost $650 million out of the General Fund each year to pay down the debt—money that could be used on other state priorities, from social programs for foster youth to health coverage for low-income families. While the Summit has supported efforts to include water infrastructure financing authorities in other areas of the governor’s budget, the governor’s staff is also reportedly exploring changes to Proposition 218—a measure approved by voters in 1996 that restricts the ability of local authorities to raise fees to invest in new types of water infrastructure. The governor is said to be looking in particular at funding popular stormwater, flood control, and groundwater projects. At least one lawmaker, Asm. Anthony Rendon (D-Lakewood), has already started down this path, proposing a bill AB 2403 that would broaden the definition of what constitutes “water service” under Prop 218 to include recycled water and reclaimed stormwater. Will lawmakers pull this policy trifecta together—strengthening the state’s water management system, building a bond to pay for it, and creating new financing tools to support water infrastructure in the long-term? “I see water reforms emerging through attention to multiple issues. The reforms then stand together as a package, as there is no silver bullet,” says Ziegler. “Things are moving in a positive direction, it’s true. But can the dialogue move from a very open, constructive conversation to legislation that brings about a more sustainable water management strategy in California? Everyone will have to give up something, and there are no easy answers. The ability to pay for important reforms, systemic improvements, and build confidence among both ratepayers and voters is the key challenge. All of this frames the critical multi-billion dollar question before the Legislature and Gov. Brown." Finding an answer will be the key to a 2014 water deal.